Margaret Rousser has 20 years of experience training a wide variety of animals from marine mammals to free flight birds to primates. She has been at the Oakland Zoo since 2006, beginning there as a Zoological Manager for the Children’s Zoo and primates. Her responsibilities during that time included serving as the enrichment and training coordinator for the entire zoo as well as managing the day to day operations of that section. In 2017, she became the Conservation Manager. 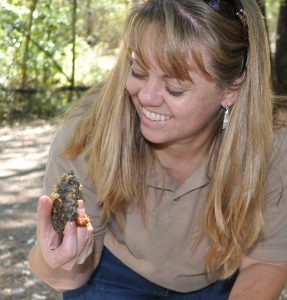 She currently manages Oakland Zoo’s Biodiversity Centre which houses the amphibian conservation programs. Margaret has a BA in Anthropology from UC Santa Barbara, and an AS in Exotic Animal Training and Management from Moorpark College. 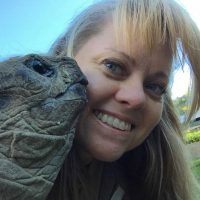 She has served on AZA’s (Association of Zoo’s & Aquariums) Hamadryas Baboon Advisory committee and was on the Board of Directors of the ABMA (Animal Behavior Management Alliance) for nearly ten years serving as secretary, Vice President, and President. She has been passionate about improving animal welfare through positive reinforcement training and enrichment throughout her career.